Written by Sharr White, directed by Scott Elliott. The New Group at Pershing Square Signature Center, 480 West 42 nd Street, New York City. Opened Sept 20, 2018; closes Oct. 28. Reviewed by Lucy Komisar Sept 22, 2018. Edie Falco is powerful as the acerbic, in-your-face, sometimes crude-talking Polly Noonan, a real operator in Albany's Democratic Party machine politics for about four decades. She was the confident and advisor to long-serving Mayor Erastus Corning. The play takes place in 1977, five years before he died. Director Scott Elliott makes it a combination soap opera and political drama. According to the New York Times, Gov. Mario M. Cuomo, who clerked at the Court of Appeals in Albany in the late 1950s, said, "Corning was the de facto leader. Polly was the leader." For more than 30 years until her death, she was also president of the Albany Democratic Women's Club. Ironic that Noonan operated in a time when she could be a power broker, but never held office. As play goes on you wonder why this Democratic machine powerhouse never had an elected post. Because she was a woman? She was the grandmother of US Senator Kristin Gillibrand, whose mother was Mayor Corning's goddaughter. Before before becoming Senator, she represented an Albany area district in the House, and she got to be US Senator through the same Democratic machine. Michael McKean as Erastus Corning, Edie Falco as Polly Noonan, Peter Scolari as Peter Noonan. Photo by Monique Carboni. 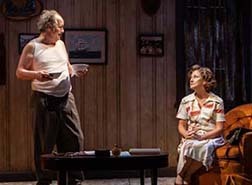 Most of the characters were dead by the time Sharr White wrote the play. Noonan was a 22-year old New York state senate secretary when she met Corning, a 28-year-old state senator in 1937. The rumors about their relationship last the years. The dramatic piece is about a possible 1977 primary challenge to Corning (Michael McKean), who held power through patronage and favors to voters as a product of the machine. It starts with Noonan at a sewing machine. Color that feminine. The mayor and her husband are listening to a Knicks game. Color that masculine. 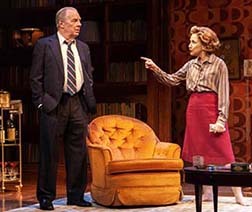 Michael McKean as Erastus Corning, Edie Falco as Polly Noonan. Photo by Monique Carboni. She knows how the political machine runs. The mayor hasn't had a challenger for 35 years. Committeemen have problems, the party takes care of it. They get jobs and city contracts. Then in the midst of a challenge to his power, the mayor tells her he wants to end their relationship. Political, not personal, though rumors have for years bothered her husband Peter (Peter Scolari), a mild fellow in a humdrum job, wearing glasses, a cardigan. Noonan and Corning may have "loved" each other in some way, but there is no indication of anything sexual. 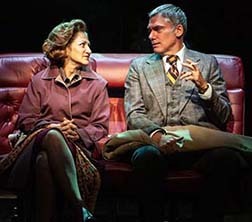 Edie Falco as Polly Noonan and Glenn Fitzgerald as Howard Nolan. Photo by Monique Carboni. Still, when a young guy, Howard Nolan (Glenn FitzGerald), a state senator, wants to challenge the mayor in the primary, Noonan goes into overdrive, seeking on her own to make a deal that would get Nolan to withdraw in exchange for a nomination on the next go-round. When that doesn't work, she moves her deal making to machine leader Charlie Ryan (John Pankow who exudes working class politician), promising he could be the next party chair, a post Corning then held. John Pankow as Charlie Ryan and Edie Falco as Polly Noonan. Photo by Monique Carboni. Throughout, Noonan insists that the deals are fine because she and Noonan really care about the voters, the ordinary people. Wives get money and jobs when husbands die. You reconsider that largesse when she explains how she is visiting committeemen's wives, telling them if the husbands don't support Corning, they will lose jobs and contracts. Does she win? And if so, what does that mean for her and Democratic politics? More about Gillibrand, her grandmother and the mayor from The Albany Times Union. "She revered her grandmother, and credits her as a political mentor. Her 2014 memoir "Off the Sidelines" was dedicated to Noonan, and depicted Corning as virtually kin. "From my perspective, the mayor was simply part of our family," Gillibrand wrote. "He appeared at every family birthday party with the most fantastic present." She treasured a small microscope Corning gave her as a birthday present when she was a young girl. It appears that Gillibrand got anointed to local and then state and national political office. White's play suggests that whatever you think of her politics, she is beneficiary of a corrupt political machine. I'm not sure she would like this play. The audience will.